AWESOMEZ.NET: Is the «Piston» Steam Box a viable gaming PC? The much anticipated Steam Box is finally revealed at the International Consumer Electronics Show 2013 in Las Vegas. It is named «Piston» which is actually quite clever, as pistons are important parts in a steam engine, and are presumably also on speaking terms with other mechanical components like valves. The question is: Will it be any good? More specifically, is it possible to pack a gaming PC into the small form factor of Valve and Xi3's rather snug looking design prototype? The answer depends on how you define the term gaming PC. 1. It will run Valve's Steam service, most likely in "Big Picture" mode, which is designed for playing PC games on a television with a game-pad. 2. It will likely run on some sort of Linux variant, as Valve's Gabe Newell is currently somewhat skeptical about the direction Windows is taking. 3. This limits software to the list of games on Steam that run on Linux. - Older Valve titles. Currently, just Team Fortress 2, but likely more to follow. - Indie games written in frameworks with multi-platform build capabilities. The current game list, with the possible exception of The Killing Floor, Serious Sam 3 and Trine 2, are all relatively low-complexity applications from a graphics perspective, and should be able to run just fine with nothing more than the integrated graphics core of a new CPU. From this perspective the «Piston» is certainly viable, but not particularly exciting as a gaming PC. There is however a possibility that there might be more to it though. The state of gaming on the PC today is that the current crop of PC games are in many ways "held back" (for better and for worse) by the current console generation, and are designed to run on consoles at 30-60 FPS in 720p. As a result, a modern gaming PC, which is far more powerful than the current batch of consoles, is usually overkill for playing modern PC games. But the good news is that if you have a decent gaming PC, you can play the same games as console users, but run them at a steady 60+ FPS in 1080p, and buy them dirt cheap on Steam holiday sales. So how powerful does a gaming PC have to be? I have tried to build a PC with the lowest specs I could possibly get away with (I have access to a lot of old parts) for playing the games I like on Steam, and it actually surprised me how little horsepower is required to run the likes of Skyrim, Dark Souls and the new XCom at the above mentioned frame rate and resolution. - Today's games are generally not bottle-necked by the CPU. If you have a CPU equal to an Intel Core 2 Duo at 2,3 GHz or over, you should be good. These CPUs date back to 2008-2009. - More RAM is always better, but RAM is generally not where bottle-necking occurs in games. If you go below 4 GB you will have problems on Windows, but that is mostly because the OS uses so much of it in the first place. On a Linux variant it might be possible to go lower. I have not found the speed of RAM to be an issue. - Hard drive performance can be an issue in games which load big textures dynamically. Examples that come to mind are Assassin's Creed 2 and the Witcher 2. These problems will however not be an issue on any system with the Steam directory on a solid state drive. - The real challenge is to get enough graphics processing power. You just can't play modern games silky smooth at high resolutions without making a push here. So what exactly is needed? The lowest dedicated GPU I found to be working satisfactory, was a Nvidia GeForce GTX 470 with 1GB of GDDR5 RAM. A card that dates back to March of 2010. Hardly the newest of the new, but a respectable card from its generation. What it all boils down to for those who are benchmark inclined, is that if you have a GPU that can squeeze out a value of 21000-22000 (or more) in 3DMARK Vantage - Performance GPU, you can play modern games just fine. However, placing a full size GPU inside the small case of the «Piston» is hardly practical, so the question becomes: Are there laptop GPUs on the market today that can match this value? In today's market there are already mobile components capable of running modern games, at the level of performance that I would describe as just fine. 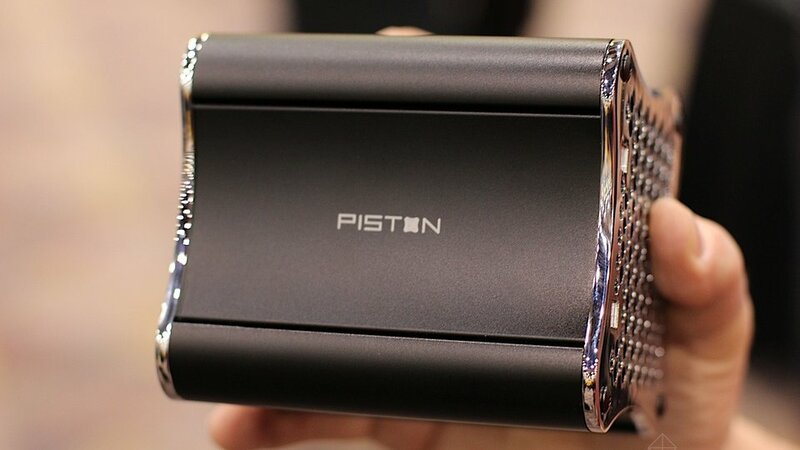 The challenge is squeezing it into the form factor of the «Piston» at a decent price level. However, if we assume that it's not due out for at least nine more months, in order to give developers time to port some more games over to Linux, I would say they have a good chance of pulling it off. Updated: I decided to add a promo video from Xi3, the company that produce the boxes. It gives a nice overview of the clever design decisions they have made. I think the idea is great. Modular computing. From what I could understand from the presentation video was that they had broken up the motherboard in pieces, so you could easily replace parts of it with other modular parts. The graphics card is still as big as in normal PC's, but I'm sure it will be possible to change it quite easily. Btw, loved your research into what you need for a decent gaming PC. At what price point could I expect to land on a gaming PC that can play modern games smoothly? In practice, any desktop PC that can be store-bought today, likely have the potential to be a decent enough gaming rig if you add a new mid-range GPU to it. The catch is that many will be stocked with a power supply that is just powerful enough to drive what is already in the case, and not powerful enough to feed the new GPU. In our country (Norway) I would say 4000 NOK for any new PC, then about 1500 NOK for a decent GPU. Thats just for playing whats on the market now. I would wait a little bit though, as I suspect that hardware will start to be pushed harder already later this year when the new generation of consoles arrive.